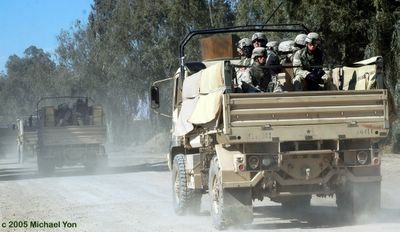 Soldiers from the US Army 1st Infantry Division begin the long road home after successfully completing what many considered an impossible mission: ensuring a secure election for Iraqis. The last of the 1st Infantry Division pulled out of FOB Gabe just a few minutes ago. It was a bittersweet scene as they piled into trucks and the convoy slowly rumbled out the gate. They are on their way back to Germany and godspeed their journey. After standing up to daily attacks, never knowing if the road ahead camouflaged bombs or obscured terrorists in its bends and twists, these soldiers have surely earned a measure of ease. It's not just that they stood straight and firm, thereby casting stability and security in their shadow. Nor is it just that they demonstrated to Iraqi soldiers and police how to exercise authority without abuse, and how to restore and maintain order without instilling undue fear among citizens. The depth, the multi-dimensional magnitude, of their accomplishments on Election Day still has not settled into the minds of many of the soldiers, although all feel justly proud of their service here. Over time, through the years, each of these soldiers will come to realize that they had a hand in history, at least on 30 January 2005, and they played it well. Make no mistake. They did not come here only to make democracy. When this war started, the focus was the fear that should weapons of mass destruction fall into willing and enthusiastic hands they would use them to make reality the oft-stated threat to target America, initiating a chain reaction of terror that could collapse our way of life. Our not finding those weapons may have reduced the immediacy of this threat, but it did not eliminate it. For that to happen, the region needs sane and stable leadership. Coalition troops cleared the way for this to happen, and they did not allow the insurgency to hijack the Iraqi people and propel them back into a repressive regime. And so these soldiers found themselves in Iraq, doing well the very things so many protested that we do poorly: Nation Building. Yet casting the United States as being a failed nation-builder is like accusing Beethoven of being tone-deaf. Beethoven was in fact deaf, yet still created some of the finest music ever composed. Nobody knows what the future will bring for Iraq. In my opinion, it's already in a civil war, though many people seem afraid to say it. Actually, the reluctance is more likely ordinal in nature–-no one wants to be the first to say what many know to be true. Many now-stable democracies have suffered civil wars. Democracy, despite its inherent nobility, is seldom easy or pretty. At its best, democracy is a reflection of the "people," and we all know what "they" are like. America has its share of critics, and we make enough mistakes to support a cottage industry of specialists chronicling our failures and footnoting our shortcomings. Even the most ardent patriot might concede that we provide fodder for this with frustrating frequency. We come complete with our national faults, embarrassments, scandals and scars, and horrors. Reminders of these can serve a necessary if painful purpose. But fairness alone dictates that it be balanced by a consideration of our national character. For every failed international initiative, we have a dozen disaster relief efforts. For every indictment of corporate greed, American ingenuity compensates with countless technological advancements. For every instance when we turn a blind eye to an atrocity perpetrated by other nations against innocent neighbors or even their own citizens, we have forests of tombstones marking the graves of our soldiers who fought and died to protect the liberty of strangers. Italy, Germany, Japan and others. . . . Modesty and discretion may not be the chief American character traits, but we shouldn't have to remind our allies about these as if they were minor accomplishments. After the 5th Symphony premiered, no one asked Ludwig to send a resume and audition tape. All of this may sound far removed from the dust, mud and routine thuds at FOB Gabe, but to some members of the 1st ID, it sometimes seemed that they were being second-guessed and subjected to a kind of roundhouse criticism that is sweeping and desperate. "How much," soldiers from 1st ID wondered aloud to me, "do the people at home know about the progress we have made over here?" I took pains to remind them that we are not alone. Our great friends--Poland, the United Kingdom, and others--have come here with us, despite similar costs to them in politics, money and blood. I list Poland first because I was there when Poland became a democracy. I watched the initial euphoria in the media coverage of that revolution deflate into skepticism about the "realness" of that democracy and its staying power. Less than two decades later, the Poles are here, standing for democracy in Iraq. Poland has what it takes, as does the Czech Republic and all the other nations who feel a kinship with any people who are struggling to replace a repressive regime with a democracy. And I tell them I saw Election Day in Baquba. I was with soldiers from the 1st Infantry Division, under the direct command of one outstanding American leader, Colonel Dana Pittard. I saw it happen and watched them do it. I heard the explosions. I saw the machine guns firing and heard their bullets flying by our heads. I saw our soldiers fight that day, and for all the right reasons. I saw our troops put themselves in harm's way to protect Iraqi people. American soldiers fought to defend Iraqi ballot boxes. I saw troops crying when their friends died, and I saw soldiers return to combat after they were wounded in battle. I saw that our troops did not allow hatred and fear to commandeer their mission in Iraq. When practically no one in the world thought it would work (especially some of us here), the Coalition and the Iraqi people delivered an election. Nations around the world were betting against the Coalition, they were betting against the intelligence and the courage of the Iraqi people, and specifically they were betting against Coalition military units all around Iraq, like the 1st ID in Baquba. They bet wrong. No matter what happens to Iraq. No matter if the Iraqi people ultimately demonstrate the strength to make it—-or not—-Election Day was a stunning success. When I saw our soldiers leaving Iraq today, not knowing if they had succeeded, worried that they had not done enough, it stopped me cold. The 1st Infantry Division suffered more than one hundred deaths and about a thousand more were injured or wounded. Many of these soldiers will carry scars and pain for the rest of their lives. They did enough. God bless them.